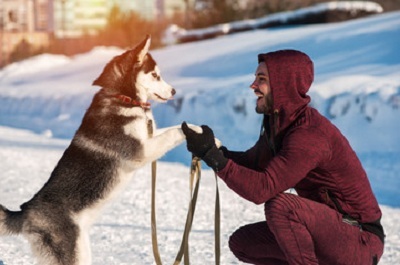 Winter time is never considered to be ideal for exercising but it is important for dogs to remain in the habit of exercising during the winters so that they can enjoy a healthy and active lifestyle. Dogs should be trained and exercised during the winters because this is the time of the year when most of the dogs begin to feel lazy and inactive. This is not a very good tendency in dogs because as pets they need to carry out some activities for their owners. Therefore the best winter exercise for dogs should be scheduled and practiced in order to keep the dogs in healthy conditions of living. The exercises are as follows. It is not safe to exercise outdoors because of the ice and the snow during the winters. Therefore dog owners should try investing some money in dog treadmill that is suitable for the dog. This machine has long strides and is also equipped with safe netting in order to ensure the safety of the dog. A treadmill can always be used to make the dog run but the energy level of the dog should also be noticed in order to avoid any kind of accidents. It is very important to take the dog for a morning walk during the winters because walking can be very advantageous for the cardiovascular health of the dog and it would also keep the dog healthy during the winters. It is not necessary to take the dog for a walk only in the morning; any time during the day can always be used for a walk rather. This is a great alternative that can be used instead of a morning walk. Interval walking boosts the metabolism of the dog. The schedule of interval walking should consist of walking for one minute, jogging for twenty seconds, walking again for one minute, sideways shuffle for twenty seconds, walking for one minute and running backwards in twenty seconds. This schedule must be repeated five times and this will prove to be a very easy workout done within twenty minutes. These are games that can be included in the category of winter exercise because these exercises do not require the dog to be taken outside but can be played indoors using the stairs. The stairs can be used by the dog for jogging up and down or even for walking and this can get the dog’s heart pumping in a healthy manner. Fetch races are games where the dog is trained to fetch its favorite toy either from the top stairs or from anywhere else in the house. The dog tag is more of a game but it can always be considered as an exercise for the dogs during the winters because this game helps in burning calories. The dog can be tagged and then allowed to chase its owner. The activity can be reversed, the tag can be switched up and the dog can be chased by the owner. Dog yoga is also known as Doga which is considered as an excellent method or exercise that can be used for relaxing and stretching the muscles of the dog. This is a very modern form of winter exercise for dogs that can be of great help for the health of the dog.